Jessica Brewster, Lovejoy High School Theater Director, describes Hot Topic as, “A tradition that is special to Lovejoy.” She said Hot Topic is meant to teach and to please. “When the audience is engaged, they are more open to receive the message.” Brewster double majored in theater and psychology at Tarleton State University. She is passionate about using theater as a means to teach students to look at their personal belief system and challenge their way of thinking. 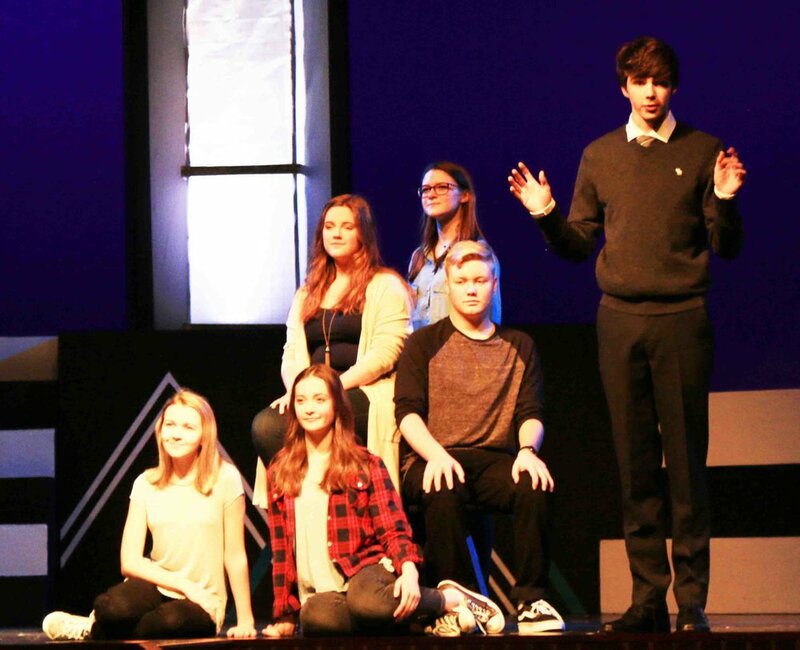 (From left) Grace Felton, Natalie Edwards, Maddie Konecny, Zane Dodd, Julia Dobbs and Luke Wild - "Family Portrait" a father contemplates his family relationships and how he affects them. Brewster likes to start the school year off with Hot Topic because it is a quick way to see how students think. Students create scripts and/or use scripts from previous years. The production is an ensemble of scenes which spotlight topics that students deal with today. Topics in the 2018 show included social media usage, anti-drugs, relationships, body image, distracted driving, drunk driving, gender equality, gossip, mental health and privilege. Of the 20 scenes, half were repeat scenes from previous years because these topics are still very important to the students. Brewster has found it interesting to see topics change over the years. Hot Topic is only performed every three years. The tradition began at LHS in 2006. This is the fifth year Hot Topic was performed at LHS. When the freshmen class begins at LHS during a Hot Topic year, they are called “The Lucky Class” because as freshmen, they will perform in the show and as seniors they have the opportunity to participate again. This year there were 14 students who performed three years ago as freshmen and now as seniors they were directors, actors or tech. The senior directors were Riley Bergwall, Julia Dobbs, Alex Doran, Natalie Edwards, Baylor Herring, Adelyn Maruca, Hallie Steadman, Kendall Vaughn and Alec Welhouse. Students in ninth through twelfth grade can participate in Hot Topic. (From left) Riley Bergwall, Emma Boland, Julia Dobbs, Sylvia Hansen and Alec Welhouse - "Social Media" characters of Twitter and YouTube arguing who is the better social media platform. The following three seniors acted in Hot Topic as freshmen and participated again this year as seniors. Kendall Vaughn directed ‘Drug Free Cheer’ and co-directed ‘Masculinity Development Class’. Gender equality was the theme of ‘Masculinity Development Class’. She said the goal of this scene was to show girls breaking stereotypes as it relates to raising children. Adelyn Maruca , in addition to participating in theater productions in school, travels along many thespian avenues outside of school. She said performing on Broadway is one of her career goals. She directed three scenes in Hot Topic and acted in five (including the opening and closing scenes which everyone participated in). She directed ‘Ding’ which focused on accepting people the way they are, not focusing on their imperfections as well as being true to who you are. She directed ‘Red Flag’ in which actors portrayed relationships and when unhealthy relationship activities took place referees interrupted the scene, blowing whistles, halting that action. Maruca feels that audience members might see red flags in their own relationships that they might not have recognized as unhealthy before seeing this scene. Additionally, the actors showed how to heal the unhealthy actions allowing for healthy relationships. She also directed ‘Mirror, Mirror’ which was a returning scene with altered elements. Maruca said this scene brought many people to tears because it dealt with insecurities. (From left) Marcie Sawyers. Claire McLaren, Natalie Edwards and Cy Feagin - LHS A Capella featured performing "You Have More Friends than You Know". Julia Dobbs co-directed ‘Masculinity Development Class’ and ‘Stomp Gossip’. In ‘Stomp Gossip’, which Dobbs also acted in, the victim of cyber bullying was center stage. The victim received horrible messages, which were read by the girls who were sending the messages, the volume increased as the barrage of negativity pounded the victim resulting in the victim throwing down her laptop and shattering it. Counteracting the brutality of the cyberbullies, three girls messaged the victim with words of encouragement. This scene carried themes of cyberbullying, minimizing gossip and the power of positive words. The LHS choir gave a moving acapella performance of ‘You Have More Friends than You Know’ which reiterated the message of encouragement and provided hope. 7417 (From left) Bryce Fuller and Adelyn Maruca in "Ding!" This is a scene about the pitfalls of adolescent dating and being true to yourself.